Our house is not one of the houses visited by little men wearing green suits, anxiously trying to protect a pot of shiny money. They do not leave their little green footprints. They do not leave any golden treasures. AND they definitely do not turn any of our breakfast food green...after all it is hard to make a pop tart/granola bar/banana green. There is a shocking lack of green, clover, rainbows and the word lucky. Sorry St. Patrick I guess you just aren't that important around here. I guess my wee ones can tell there therapists later about the loss of you in their early childhood. 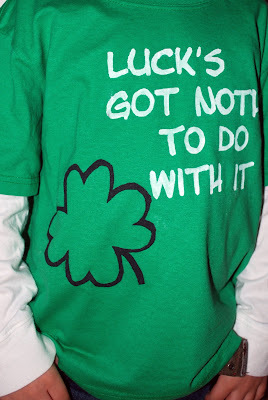 So today, this will have to do--2 out of 3 children wearing green. Acknowledgement of St. Patrick completed! Can you just imagine this on the cutest little girl noggin??? Disclaimer: I am a sew-by-the-seat-of-my-pants-figure-it-out-as-I-go-make-some-mistakes-fix-and-hide-self-taught seamstress. This is how I do it...as are all my tutorials. There might just be an easier way of doing it and a fancier way of explaining it. Hopefully it is figurable-outable. Cut material and lay out. Cover elastic first. Fold 2x3 piece in half and iron. Iron length edges in 1/4 of an inch. Lay elastic piece inside and sew one end of the elastic inside one end of the fabric strip. Continue to sew along open edge, making sure on this edge not to sew on the elastic. Feed the non-sewn end of the elastic through to the other open end, stretching it out, and pin. Sew that end, securing the elastic in and then sew along the other lengthwise edge, again making sure not to sew the elastic on this edge. You will have a scrunchie piece now. Place scrunchie piece between your two strips of headband material, sandwiching in like so. Sew around the edges with a 1/4 inch seam allowance. Leave an opening to turn out fabric on the opposite edge of where you have the scrunchie piece sewn in. Make sure to clip the corners like so...this will help your corners lay better. Turn out headband. Make sure to use something pointy to help define the corners. Fold in edge of unfinished edge and iron. Pin the end of the srunchie piece into the unfinished, ironed edge. Sew piece in place, and then continue to sew around the edge of your entire headband, for decorative purposes. Place two circle pieces right side facing. Pin. Sew around edge with 1/4 inch seam allowance, leaving an opening to turn out. Turn out. Iron in unfinished edge. Sew around the outside edge of the entire circle. This piece will go behind your completed flower. Cover button with scrap material. Use a button kit. Sometimes I use hot glue instead to secure my fabric in place. When fabric is covering front of the button, secure the back. Fold flower strip of fabric in half and iron. Then hand sew a long the rough edge to gather. Finish sewing all the way up the edge and then gather. Wind into a flower shape and then hand sew your flower. Sew button to the middle of your flower. Before attaching the flower to the headband. Attach the flower to the circle piece. After the flower is secured to the circle, attach circle to the headband. As you are doing this make sure that your needle is not coming through the second layer of material aka the inside fabric. You want your hand sewing to be invisible. Now put it on whichever cute girlie noggin it was made for. Corey and Jen...I can wait to see pictures. the headband is so cute. i thought about trying to make one...but it looks like too much work for a mom of a 10 day old. so maybe i can solicit you to make one for me??? you're getting so talented riss! Love ya! super cute! I've made these before and I think your tutorial is about as good as they get. I made mine up as I went along too but it looks like I made it harder than I could of.....plus your fabric is cuter (as always) Love the cute ideas you have flowing on your site!!! I am totally making you one!!!! I will email you to get the head measurements!